NCAA Football 10 is an all new and exciting American football game that has been highly anticipated by gamers all around the world. This critically acclaimed game is excellent in every way and really captures the essence of American football perfectly and had me addicted within minutes. It is a graphical masterpiece and the players and characters really come to life. 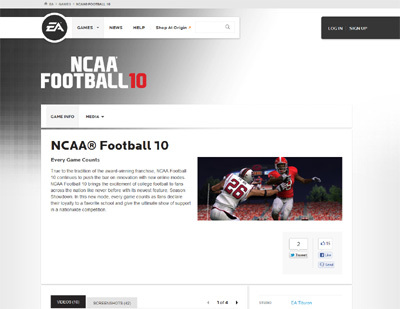 We have also compiled a Review System for this, of which NCAA Football 10 is Rated as Five Stars, the highest possible score available from the Game Review Team.